Easter and lamb are synonymous. Thanks to the Tri-Lamb Group we have gotten to try a variety of lamb dishes. We have used butterflied leg of lamb, lamb shanks, ground lamb and lamb shoulder. The one cut we haven’t tried is lamb chops. Lamb chops can from variety of places on the lamb. 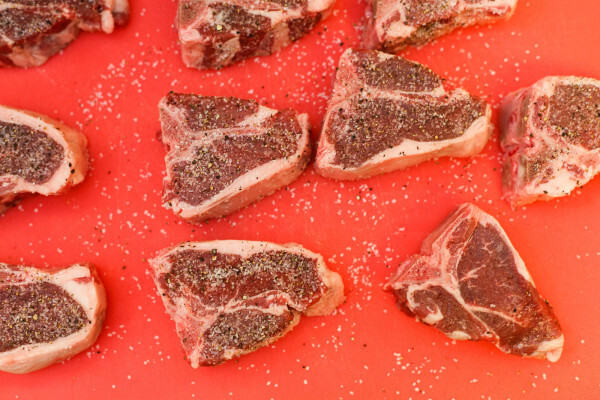 Lamb loin chops are sort of like mini T-bone steaks. They have a bit of the loin and the flank separated by a bone. The nice folks at the Tri-Lamb Group offered to send us lamb loin chops. We checked with our downstairs neighbors, who make up the rest of Team Lamb, and they were game for hosting another lamb dinner. 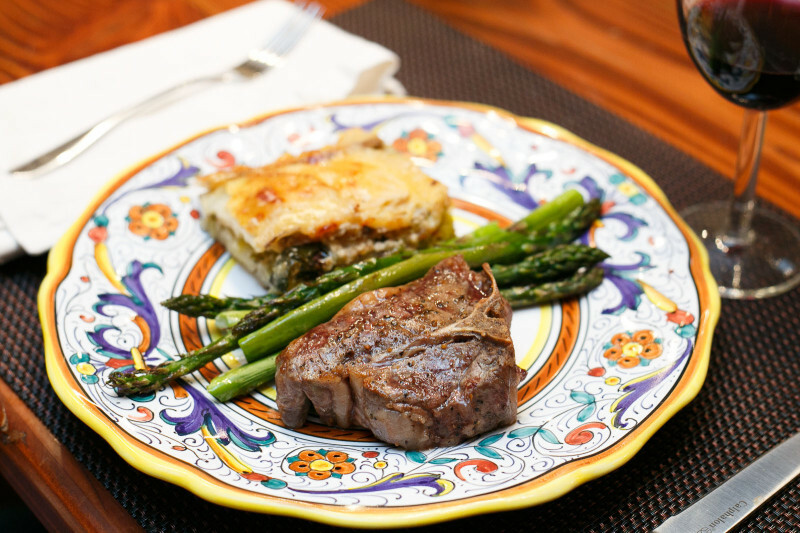 We all decide to have a practice Easter dinner or a… Preaster (Ha, get it?) We based our menu of this Easter one from Martha. 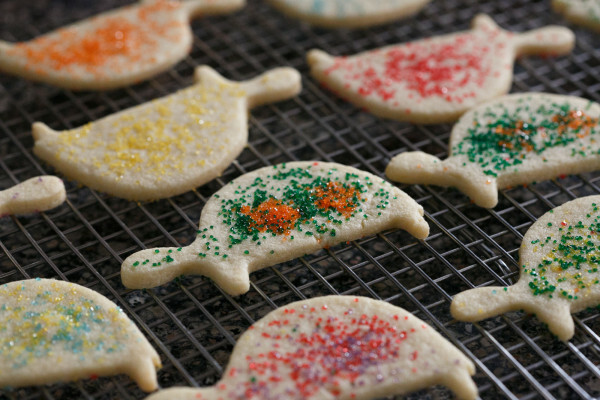 However, instead of making Sugar Bunny cookies we went with turtles because that was the only cookie cutter we could find. I received 10 lamb loin chops, which were beautifully cut and trimmed. I was excited to try cooking a new cut, but I was also a little nervous because it is also one of the most expensive cuts. 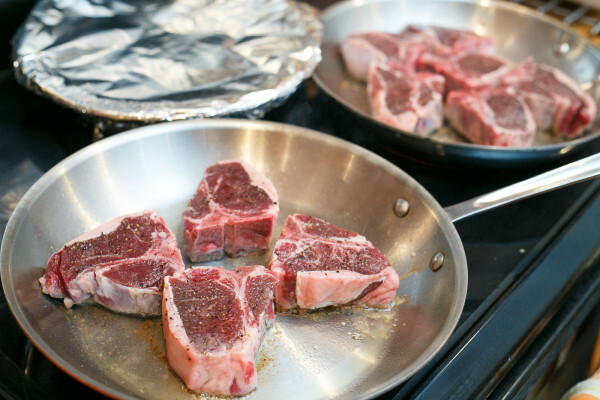 Pan frying, broiling or grilling are the best way to cook loin chops. If you have thick cuts, like we did, you are going to want to sear it first and then finish cooking it through in an oven or the cooler part of the grill. I didn’t marinate the chops but instead covered them in salt and pepper. Don’t be shy with the salt. Make it rain! I let the chops sit with the salt on them for about an hour and then dried of the moisture on top with a paper towel.How did turn out? Amazing! It was the best lamb dish we have cooked so far. I really like the chops, they are full of flavor but not huge like a rib eye. 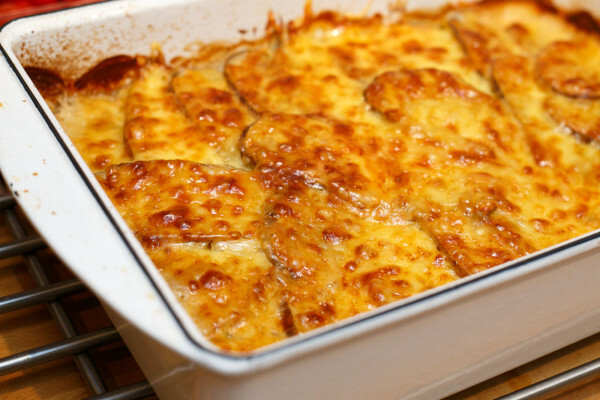 Even with the best dish, you tend to burn out on a flavor. The last bites of a big dish are never as good as the first. These chops had a high impact hit that leaves you smiling at the end. Having the “bone-in” makes a portion seem larger in addition to adding flavor. While lamb is naturally lean meat, chops are aÂ great cut that provides a portion that is full of flavor and not too large. We had 10 chops for 6 people. That worked out perfectly. Most people had 1 chop but the hungrier guys ( me included ) had 2, with only one chop left over. Preheat oven to 325 degrees. Butter a 9-inch round cake pan. Line bottom with parchment cut to fit, and butter parchment. Dust with flour, and tap out excess. Combine sour cream, vanilla, zest, and juice. In a separate bowl, whisk flour, baking powder, baking soda, and salt. Beat butter and sugar with a mixer on medium-high speed until pale and fluffy. Add eggs and whites, 1 at a time, beating well after each addition. Beat in sour cream mixture. Reduce speed to low, and beat in flour mixture until just combined. Transfer to pan, and smooth top. Bake until a toothpick comes out clean, 40 to 45 minutes. Let cool in pan on a wire rack for 5 minutes, then turn out cake onto rack to cool completely. (Cake can be stored in an airtight container at room temperature overnight.) 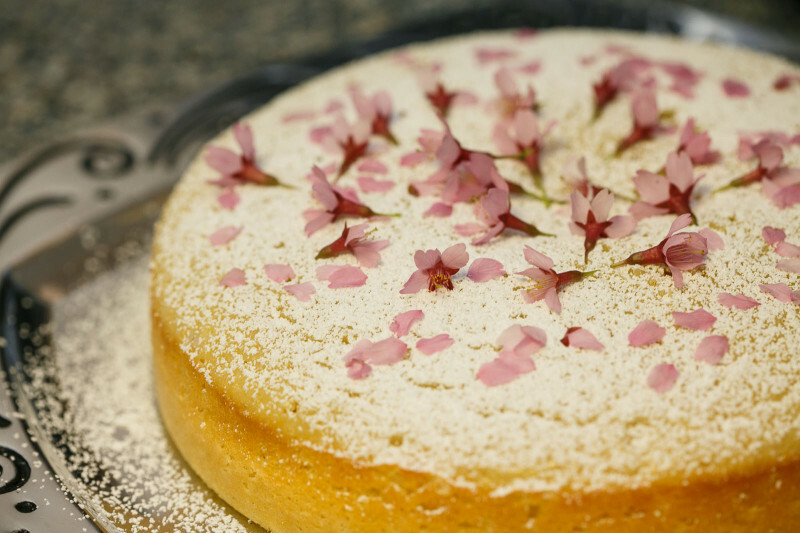 Before serving, dust with confectioners' sugar, and arrange flowers on top. Sift flour, baking powder, and salt together into a bowl. Beat butter and sugar with a mixer on medium-high speed until pale and fluffy. Beat in egg and vanilla. Reduce speed to low. With machine running, gradually add flour mixture; mix until combined. Shape into a disk, and wrap in plastic. 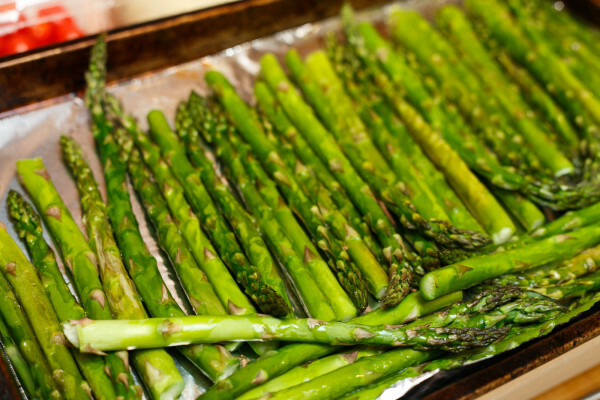 Refrigerate until firm, at least 45 minutes (or up to 3 days). Preheat oven to 325 degrees. Transfer dough to a lightly floured work surface. Roll to 1/8 inch thick. 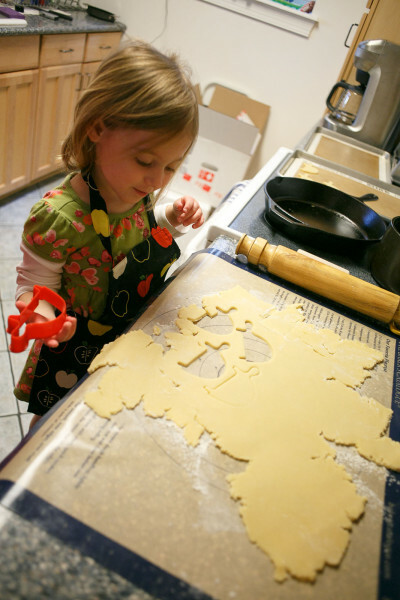 Using a 5-inch-tall bunny-shaped cookie cutter, cut out cookies. Space 2 inches apart on parchment-lined baking sheets. Reroll scraps, and cut out. Refrigerate until firm, about 15 minutes. Bake until golden, 12 to 15 minutes. Let cool completely on sheets on wire racks. Cookies can be stored in airtight containers at room temperature up to 1 week. These lamb chops look amazing! I’m so sorry we missed them!